After two decades of pain, disappointment, and shame, for the last couple years, it’s been fun to be a Warriors fan pretty much every day. In their first playoff game ever in Oklahoma City, the W’s got destroyed. Their offense was disorganized, their defense was undisciplined, and they looked just generally lost. The officiating didn’t help matters; there were some truly perplexing calls, and while I can’t exactly blame a 28-point loss on the referees, they sucked all the life out of a game that was still in question in the second quarter. But the low point had already come, way back in the 1st. 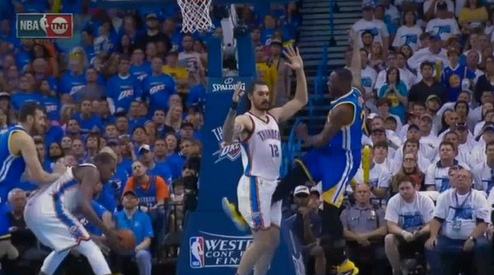 Draymond Green drove with Steven Adams defending, a foul was called, and then…well…it looked for all the world like Draymond kicked the big Kiwi in the nads in purpose. I love Draymond to death, but that’s no way to act; we’re supposed to be the good guys. He was called for a flagrant foul and may end up being suspended for Game 4, which would be, in a word, bad. It was a disheartening spectacle all around, and the doomsaying in the media has already begun. I’ll be doing my level best to avoid all the pointless chatter over the next couple days; in the end, it was just one game, and the W’s will have another chance to steal back home-court advantage on Tuesday. Till then, protect your vitals, everybody. This entry was posted	on Monday, May 23rd, 2016 at 8:40 am	and is filed under Golden (State) Years. You can follow any responses to this entry through the RSS 2.0 feed. You can leave a response, or trackback from your own site. I want them to win so badly. The 73 win season validated last year’s ring. A ring this year would validate the 73 win season, and would make them the best team ever.